This Black RG59 Siamese Coaxial Cable is designed for direct burial and/or outdoor use. It features an RG59 Coaxial Cable paired with 2 18AWG power wires. The Coaxial cable is 75 Ohm and has a solid copper center conductor, the braid is 95% coverage CCA. 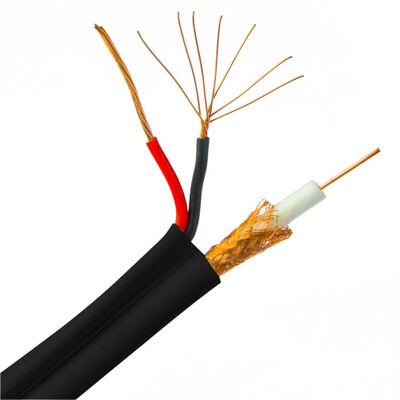 The power wires are 18AWG Stranded copper rated to 30 Volts and an operating temperature of -20C to 60C. This is an ideal cable for security, surveillance and CCTV applications where one needs to distribute video and power to cameras in remote locations.